I’m not sure how to review this book. I’m not even sure how to categorize it. Is it about a woman’s depression following the unexpected death of her father? About an intense relationship between woman and hawk? About the seemingly impossible projects we like to focus on when confronted with an unbearable reality? I guess those descriptions are all close, but they don’t seem like enough when trying to explain Helen MacDonald’s stellar H is for Hawk. Here’s the inadequate summary: After her photographer father’s death, Helen withdrew from the world. For complicated reasons, the author and longtime falconer decides to raise and train a young goshawk. They’re “bulkier, deadlier, bloodier, scarier” than other hawks and infamously difficult to train. Her book outlines that training-weaving in meditations of her life, aristocracy, belonging, manhood, loneliness and author T.H. White-and the lessons learned about beauty, surrender and loss. I know that might sound unbearably pretentious but hear me out. She names her goshawk Mabel throws herself into training her, using her newfound passion to bandage the wound left by her father’s death. She retreats into her home, turns her freezer into a morgue for Mabel’s unfortunate meals, and falls in love with this strange animal. As she does, she also rereads a book from her childhood, T.H. White’s The Goshawk about his attempt to train his own falcon. Most of us know White as the author of The Once and Future King, but he had a fascinating, troubled life. He spent much of his life on his own-partly because he was raised by a violently alcoholic father and a difficult and callous mother-and partly because he wanted to hide his homosexual and sadomasochistic urges. Instead, he takes all of his energy, all of his passion, all of his love that he couldn’t share with anyone, and directs it towards his goshawk. I’m sure this review isn’t encapsulating the totality of this strange little gem of a book. But do yourself a favor and pick it up. 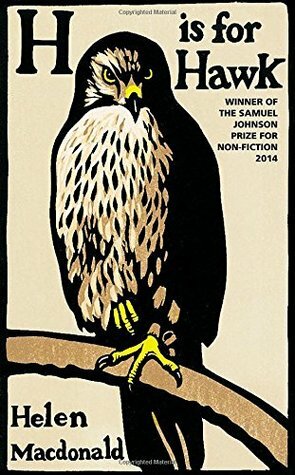 Exquisitely written and surprisingly charming, H is for Hawk is a truly original and commanding read. You make this sound so interesting!